We review Codex: Card-Time Strategy. While Codex isn't the best collectible card game out there, it is the best un-collectible card game out there with it's blend of CCG and RTS elements of gameplay. Let’s go for a walk down memory lane. Raise your hand, dearest reader, if you were first exposed to hobby gaming through the addiction inducing Magic: The Gathering. It’s just as I suspected. And who among you weaned yourself off of MTG and landed yourself on this side of the board? You are not alone. I have found in a completely unscientific poll that players stopped playing MTG for predominantly two reasons: because the constant collecting cut too deeply into their monthly food budget or because the rule-set evolved into a game too dissimilar from the one with which they had started. Codex: Card-Time Strategy is not Magic: The Gathering. It shares very little with the classic collectible card game that attracted many of us to the hobby. The ruleset will generally not evolve through time, the cards you own are all the cards that will ever be released (allegedly), and even if you piecemeal it out and purchase the color factions separately over time, you do not have to be concerned about completing your collection staring through the paned glass of your FLGS at individual, severely overpriced cards. The tournament circuit does not dictate card value here. Sets are full sets; completists be satiated. But, the question remains: how good is Codex: CTS after all? What is “Card-Time Strategy”? Does this really scratch the itch of the hobby MTG enthusiast? 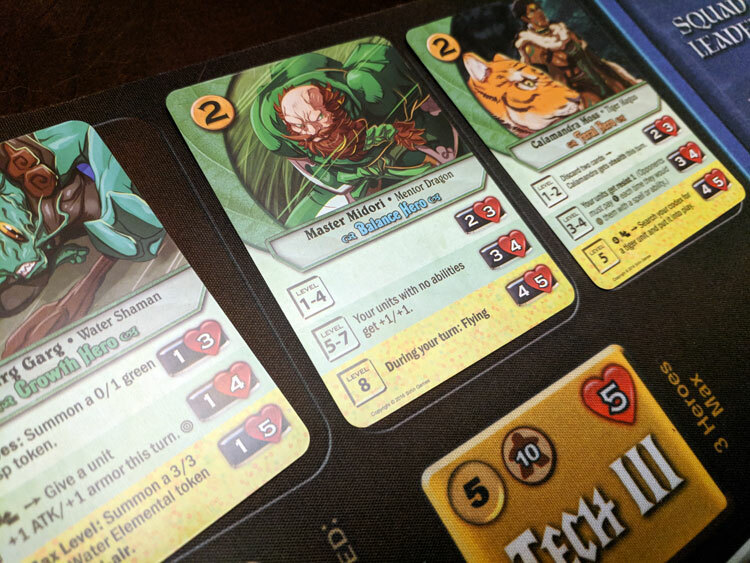 Let’s start with the basics: Codex: Card-Time Strategy is a deck building card-combat game for 2-5 players that takes about 45 to 60 minutes to play. Codex plays best with 2 players. 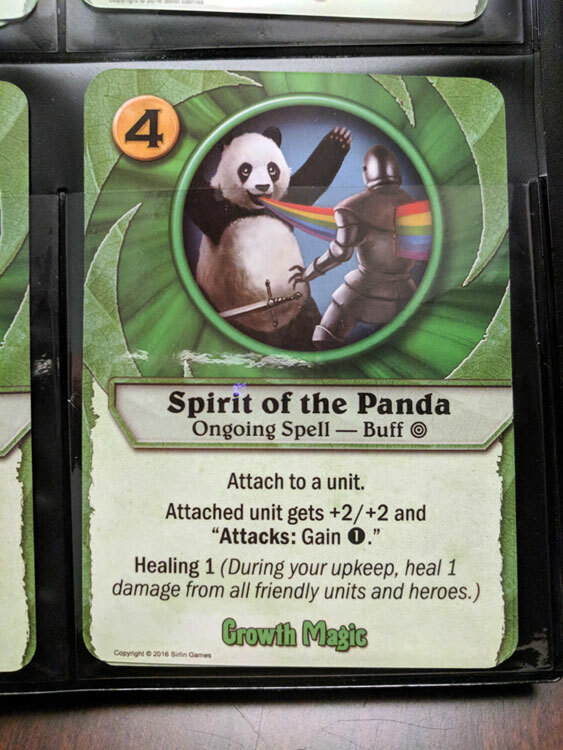 It’s the most panda-tastic card art that I have ever seen. In Codex: CTS, each player starts the game with a set of heroes (one to three), a starting deck, and a binder… err… Codex… of 24 cards per hero. Each turn, a player’s workers generate a certain amount of gold that can be spent to build up a player’s draw deck with the cards from their Codex. Anyone who has played MTG before will find the phase system is similar: Ready, Upkeep, Main, Discard/Draw, and Tech. 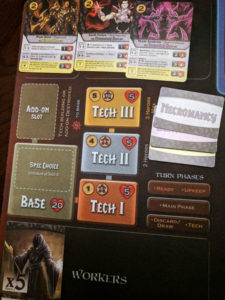 Generally speaking, units are played either in the players’ main play area or onto different locations patrolling on a player’s play mat (i.e. Squad Leader, Elite, Scavenger, Technician, and Lookout) which dictates the role and benefits that that unit will receive in the fight until they are moved or removed. The ultimate goal of each player is, of course, the destruction of their enemy’s base. Similar to the tech-tree systems of real-time strategy games that Codex leans on, bases can be upgraded to permit stronger unit deployment or general play-modifying changes. That’s a general overview of how the game is played. To dive in deeper, the latest version of the rules can be downloaded from Sirlin’s website. CCG players will be pleased with the breadth of asymmetrical combinations of factions and heroes available in Codex. I really enjoy Codex. Like, really enjoy Codex. I’ve played it several times and at the end of each game I feel like there is a tremendous amount of strategy and depth I have yet to explore. Playthroughs are varied thanks to the amount of content within each color and the fact that players can mix heroes of different colors means that the number synergies that can be explored explodes. For a game that is completely self-contained (or easily collected), this alleviates much of the concerns I originally had. The player mats to do a great job of keeping cards and statuses organized, but they are more than just good looks, they are required for gameplay. The six factions available in the game feel varied and (for the most part) fresh and the abilities of the different factions allow for asymmetrical gameplay that demonstrates the flexibility of the system. This is not your run of the mill fly-by-night collectible card game. This is a fully formed deck-builder with depth of strategy and tactics. I initially did not believe that the real-time strategy genre could be conveyed in card form. I was under the impression that the tabletop real-time strategy equivalent was civ-building or miniatures, and that Card-Time Strategy was just some marketing gimmick. Don’t get me wrong, the real-time strategy mechanisms that Codex is attempting to employ are stripped down versions of the behemoths in the Blizzard classics, but I would argue that while a game like Civilization is a (several hours) port of the computer equivalent, Codex is the true essence of the genre and hits all of the marks. The tech tree does not feel forced or overly burdensome as is the leveling of heroes. The entire game system is simple, but is by no means dumb. The depth to the game is increased by the faction(s) playing, allowing players to choose-their-own adventures and opt for more or less challenging gameplay. Component-wise, the card quality is fairly good and while the artwork generally can’t hold a candle to that of MTG, although not much else can either. 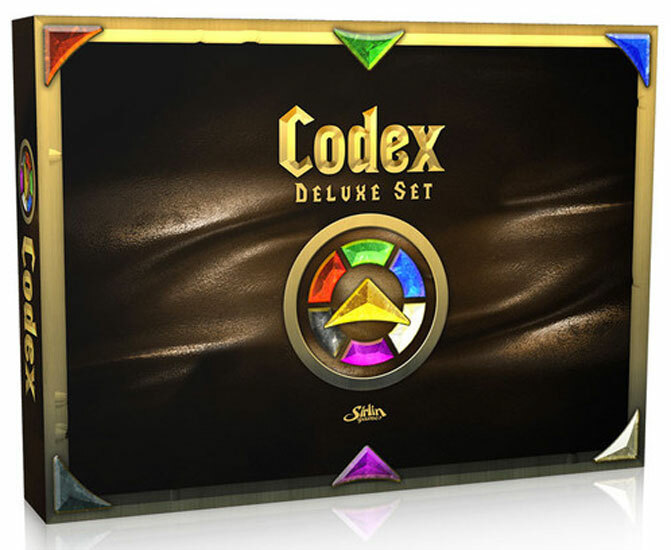 The Deluxe Set comes with the fantastic codex binders that the game has become known for and, while not a requirement, they are pretty cool. My one quibble with the components is that cards cannot be organized into the binders while they are in the game box. The top does not facilitate all of the cards in the binders at the same time. While this isn’t a deal breaker, it is a bit annoying and something to keep in mind if card management is a driver for you to purchase the completist’s edition of the game. Leveling heroes adds a lot of strategy to the game both in unit ability and magic that can be cast. I cannot stress how rewarding playing this game has been for me. Working out the strategies between and within different factions is immensely rewarding as is finding those combinations of heroes and units that mesh with different play styles. Codex: Card-Time Strategy feels fresh every time it hits the table and the rules are simple enough that bringing new players on board is not a feat by any stretch of the imagination. What it lacks in the scope of traditional collectible card games and real-time strategy games, it more than makes up for in its original approach to familiar mechanisms. Frankly, if you are someone who is always looking for the next big collectible card game or real-time strategy game for your game night, Codex might be the game for you. 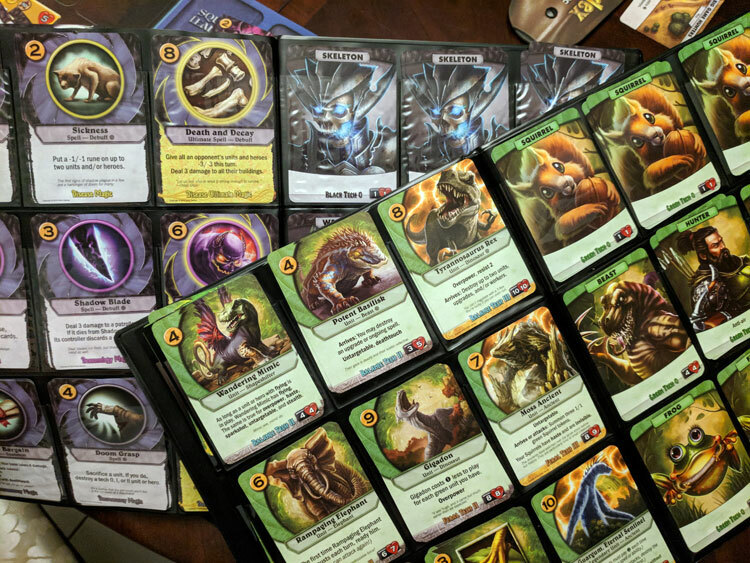 However, if you are someone who enjoys a fun deck building card game with plenty of card combinations and strategies to explore, then Codex: Card-Time Strategy is the game for you. 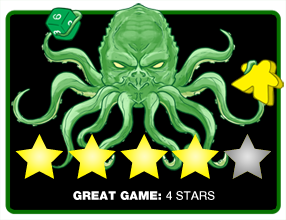 Final Score: 4 Stars – It isn’t the best collectible card game out there, but it is the best un-collectible card game out there.